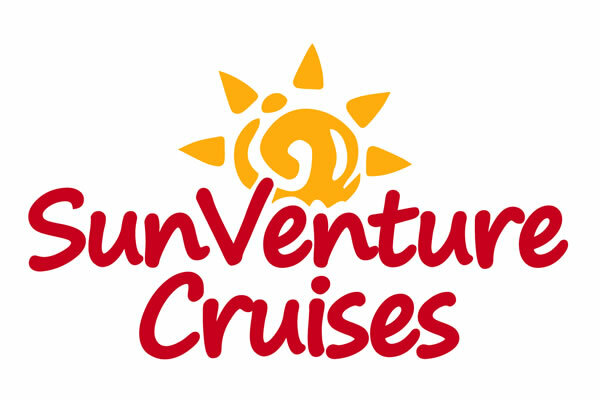 SunVenture Cruises began its new ad’venture’ in the epicenter of the action – the Destin Harbor. The SunVenture I came to the crown jewel of Destin Florida in 2012. 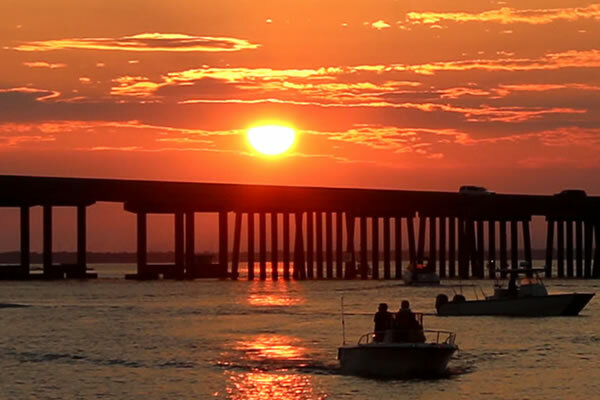 For the past seven years, the SunVenture I has been offering daily summer cruises from the Destin Harbor to Crab Island, Dolphin Sunset Cruises, Private Cruises and Destin Harbor Fireworks Cruises. The SunVenture I is a water lover’s 45 foot, custom built vessel for up to 49 passengers. This sporty catamaran offers a personal setting with all seats offering close views of the waters and wildlife on all its Destin cruises. The SunVenture I features a large shaded area, restroom on board, a spacious open-air arrangement, state-of-the-art sound system and a fold down ladder. The SunVenture I is conveniently docked at Heron Harbor, right in the heart of Destin Florida. Heron Harbor is located a 1/2 mile east of the Destin bridge, right across the street from the St. Andrews Episcopal Church. 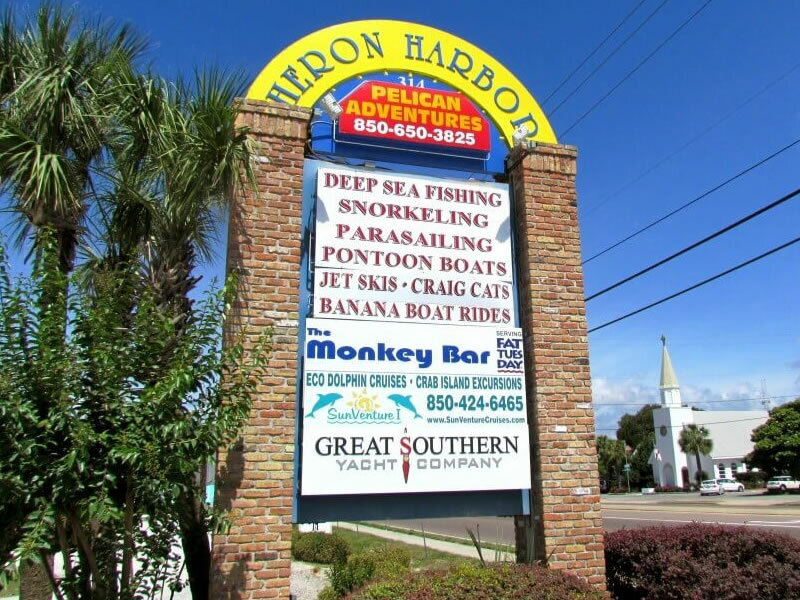 Heron Harbor offers a plethora of things to do in Destin Florida including a marina, waterfront restaurants and bars. Experience the difference. 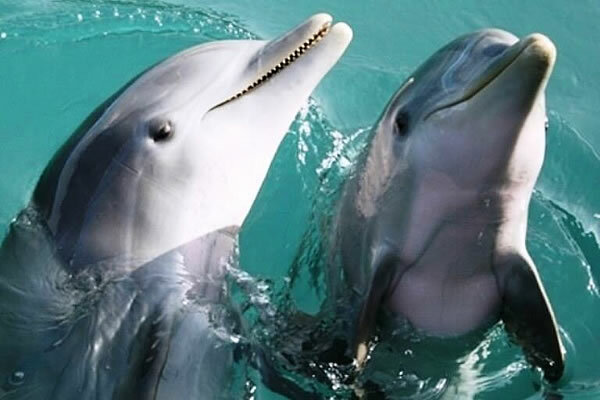 Destin cruises on the SunVenture I are truly different because we offer a more personalized, intimate atmosphere where guests are within arms reach of the water and get the closest views of the Destin waters and wildlife. Our captains offer a unique experience on our Destin cruises as well, making customer service and fond memories their priority. In addition to educating and entertaining, our captains will go above and beyond to make sure everyone has an unforgettable cruise experience, even giving guests and kids an opportunity to drive the boat. Your SunVenture I experience begins with an entertaining and historical account of the amazing Destin Harbor. Enjoy a leisure cruise through the Destin Harbor waters as you learn some interesting facts (past and present) about the World’s Luckiest Fishing Village. Guests can expect a personal tour as our captains make you feel like family in a relaxed setting. For our Crab Island Destin Cruises, guests will enjoy a short cruise through the Destin Harbor and under the Destin bride to this underwater playground. Our captains will navigate the busy waters while you relax and enjoy the views. The SunVenture I will anchor in the middle of all the action at Crab Island and stay with you the entire time. Our captains will be available to help you on and off the boat with our drop down ladder and you have full access to a restroom, your cooler and shade the entire time. 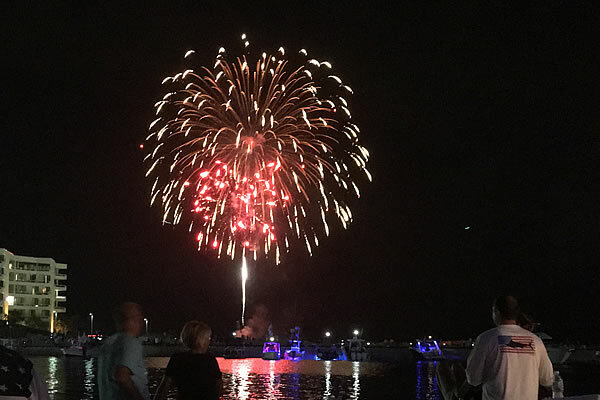 Our Destin Dolphin and Sunset Cruises and our Destin Harbor Fireworks, Sunset, Dolphin Cruises are just as memorable and interactive. The SunVenture I captains will take you on a quest to find dolphins that will be within arm’s reach and make for some great pictures. Our captains know the perfect spots for you to experience unlimited views of the sun setting over the Destin bridge and Destin Harbor. They also know where the best seats are on the water for the Destin Harbor Fireworks show every Thursday night. Destin private cruises on the SunVenture are easier and more affordable than renting a boat in Destin Florida. We can host Destin private cruises for up to 49 guests and we can bring over the SunVenture II for a total of 98 guests for private cruises. Private cruises are available at a fraction of the price of renting a pontoon boat in Destin Florida or any other boat rentals. Plus our captains do the driving through the busy waters of Destin while you relax and have fun in the sun. Remember that if you can’t find availability on the SunVenture I at the Destin Harbor, make sure to check the cruise schedule for Okaloosa Island – only five minutes away.